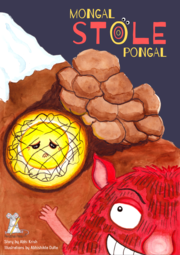 Mongal Stole Pongal | GetLitt! Mongal is a GRUMPY monster. He hates color, he hates happy sounds and especially hates it bright and sunny. With the harvest festival around the corner, he steals the sun and locks it away in a mountain cave. What a HULLABALOO! What will happen when there’s no more sun? Will Mongal learn his lesson and make amends?